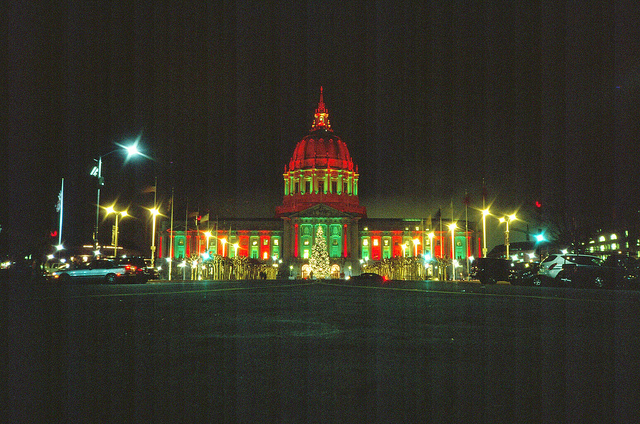 "The lighting of City Hall has to be one of San Francisco’s most wonderful traditions," or so wrote Willie Brown in his Chronicle column this weekend. 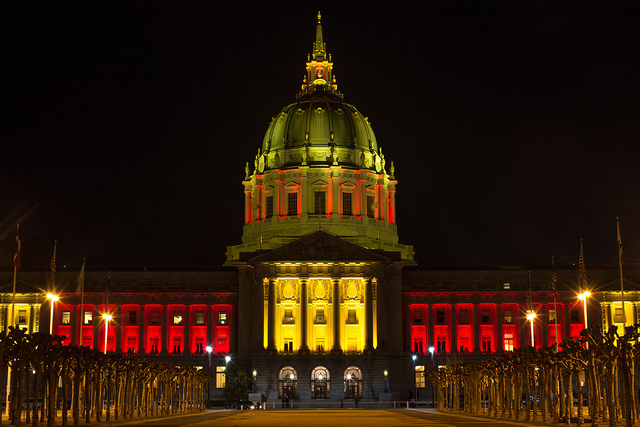 "It’s almost become a game to try to figure out the significance of the color combinations illuminating the grand building all the way up to the dome." In "Willie's World," San Francisco would embrace this trend, and hey, maybe even light up his span of bridge: "Personally, I think we should have a Season of Lights in the city. It would start, say, in the first week of November and run until March. We’d have a contest among buildings all over the city to see which could be the most creative. It would be a great draw for tourists, and most of all it would help make all these early and long nights a lot brighter. Then San Francisco would be a city of lights. Just like our sister city Paris." Paris isn't our only sister city, of course. Let it be noted that we've got dozens. 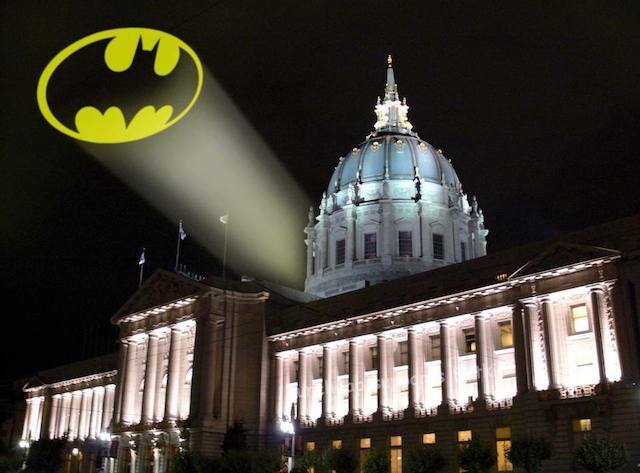 Back to the "game" of figuring out what City Hall lights signify what occasion, let's play along, shall we? Says Brown: "Some are easy: orange for the Giants when they’re in the playoffs..."
"red and gold for the Niners..."
"And red, white and blue is a no-brainer." "Others, however, take a bit of political savvy. There was purple in October, which was anti-domestic violence month. More recently, we had blue, pink and white for the Transgender Day of Remembrance." Alright, that's it for Willie, but can you guess this one? Hint: it's coming up! 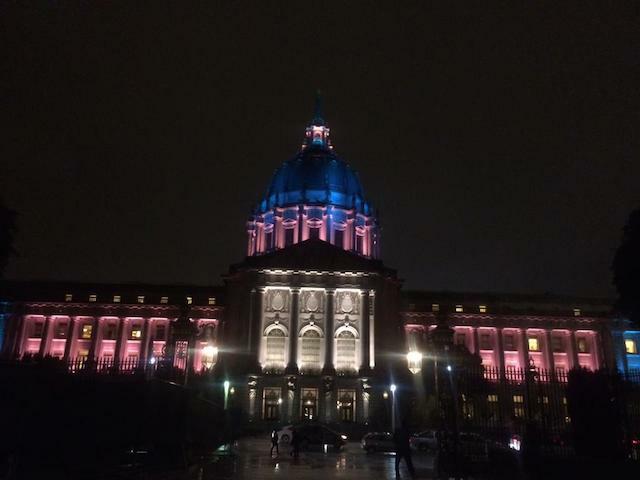 And for the record, when City Hall was blue last December, it was for Twitter's holiday party, not Hanukkah.